The victims of atrocities provoked by Slobodan Milosevic, the “Butcher of the Balkans”, said last night they had been robbed of justice by his death only weeks from the end of his war crimes trial. When Zarema Valgasova last saw her son, he was semiconscious and bleeding profusely from a badly broken arm with cigarette burns on his body - the result, she says, of police torture after his arrest. Yet again, Putin kills his own. In a desparate attempt to save hostages, the Russian soldiers killed 100s of children. Thousands of relatives of 8,000 Muslim men and boys slaughtered in Bosnia in 1995 gathered on Monday to bury 600 victims of the Srebrenica atrocity, seen by many as Europe's worst since World War II. Cell phone conversation between hostages and the media during the crisis reveals what really took place at the theatre. Yugoslavia's pro-democracy leaders drafted a government decree Friday enabling Slobodan Milosevic's extradition to the U.N. war crimes tribunal after abandoning an effort to win passage of a law through parliament. Shaheedah Hawaa` Barayev, 19 years old. Hawaa` was shaheed as she drove and detonated a car, laden with explosives, into the centre of a Russian Special Forces building in Alkhan Kala. 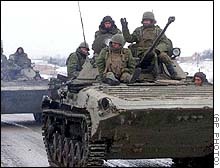 What Are the Actual Reasons Behind the Chechen War (1999-...)? "The refugee flow from Chechnya to neighboring Ingushetia has topped 133,000, but supplies still are lacking, according to the territory's leader."